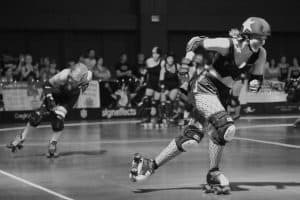 On today’s episode, I have the Texas Rollergirls photographer Felicia Graham on the show to talk about her new book, Rollergirls: The Story of Flat Track Derby. The second edition of her book. Why she likes roller derby and why she thinks so many people like it. If you are into roller derby, then you will want to checkout the book. To get a sneak peek of some of the photography in the book, here are a couple of photos from it. You can see more of them over at Felicia’s website. All photos below are printed with permission from Felicia Graham. Jeff Stone: 00:03 Hey everybody. Welcome to the Roller Skate Dad podcast. This is episode number seven. Let’s get started. Announcer: 00:21 Welcome to the Roller Skate Dad Podcast. The show that covers everything and anything in the wonderful world of roller skating. Now here’s your host though. The Roller Skate Dad himself, Jeff Stone. Jeff Stone: 00:36 Hey everybody. Welcome to the Roller Skate Dad podcast. Want to thank you guys so much for being here. On today’s episode we have a special guest. 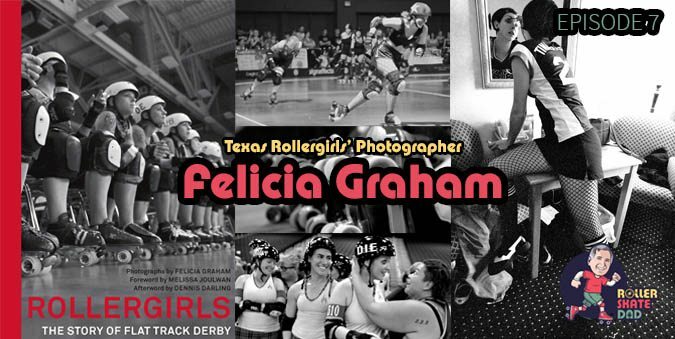 I have professional photographer for the Texas Rollergirls, Felicia Graham on the show. And, Felicia is the recent author and photographer for the new book called Rollergirls, The Story of Flat Track Derby. And the second edition just came out in November of 2018 and it’s now available on Amazon. So Felicia and I sat down, we talked Texas Rollergirls, we talked about her new book, we talked about photography, all kinds of great stuff. So, I think you’ll enjoy this one. Also, be sure to stick around until the end of the show where I’ll have a special announcement about the February contest that I’ll be doing on RollerSkateDad.com. So, be sure to check that out at the end of the show. Jeff Stone: 01:34 All right, on with the interview, let’s go. Jeff Stone: 01:39 Hey everybody, today I’ve got Felicia Graham with me. She’s the author of the new book called Rollergirls, The Story of Flat Track Derby. Hey Felicia, welcome to the show. Felicia Graham: 01:51 Hey Jeff. Thanks for having me. Jeff Stone: 01:53 Yeah, thanks so much for being here. I really appreciate you making time to tell us more about yourself and your new book. Felicia Graham: 02:01 I’m looking forward to this. Jeff Stone: 02:04 So you know, I got your book right before Christmas and you know, it’s really beautiful. I mean, it’s this hard cover 224 page, you know, photo chronicle of the Texas Rollergirls. I was wondering if, you know, just to start, maybe you could tell us a little bit more about your book, you know, in your own words. Felicia Graham: 02:23 Well it’s, it’s a photographic story of the 10 years of Texas Rollergirls from like maybe their second or third year in and on. So I got the early days when they were kind of the, the godmothers of the sport and kind of ruled the roost so to speak, because they, they always won everything back then. But it was a good day. It’s the good old days of the Texas Rollergirls. Jeff Stone: 02:51 Awesome. So for our listeners who may not be as familiar with the Texas Rollergirls, could you give maybe like a brief idea of, you know, where the league came from and how it started because I know you’ve been with them like you said for a while now, so I know you probably know the history pretty well. Felicia Graham: 03:13 It started in 2001 or 2002 when it was this one league and then it got, had this big upheaval and half the league left and formed another league called the Texas Rollergirls. And once they were formed, they formed it flat track instead of banked track and it just kind of blossomed from there. They kind of started a whole new way. Now there’s like, you know, there’s like 480 leagues in the Women’s Flat Track Derby Association from all over the world. So it’s, it’s a huge thing now. I mean there’s like 4,000 Derby type leagues in the world. Of all different like men, women, banked track, flat track. That’s how big it is now. Jeff Stone: 04:00 That’s huge. That’s really big. Based on reading the forward in your book, it sounds like really the, the Texas Rollergirls were kind of the start of all that. Felicia Graham: 04:12 They were definitely, they were the first league, so that’s why there’s the Godmothers of modern day roller derby. Jeff Stone: 04:19 That’s awesome. How did you get involved with the Texas Rollergirls? Felicia Graham: 04:24 It was a fluke. I was in Grad school and I had a friend that was one of the founding members. She’s a Electra Blue and she was a bartender friend of mine and I was like, “I need to do something that’s not school related”. She’s like, “Come and shoot the Derby! I want to do it one time.” And I was addicted from the beginning. I was nonstop after that. It became a quick addiction for me. My new labor of love. Jeff Stone: 04:54 So did you actually ever play Derby with the girls? Felicia Graham: 05:00 Oh, no. I like all my extremities to work and especially being a new skater, they tend to get hurt pretty bad and I can’t do my job if I don’t have my extremities working. So, I chose to stay off. I can’t shoot if I’m skating either, you know? Jeff Stone: 05:19 Good point. Yeah. Do you actually roller skate? Felicia Graham: 05:23 I can. I just can’t stop. That’s it. I can go around and around with the best of them, but I have to slam into the wall to stop myself. Probably wouldn’t have been that good on skates anyway. Jeff Stone: 05:35 I see. So you’ve been with them for, you said since 2005? Felicia Graham: 05:40 12 years. Jeff Stone: 05:41 12 years? Wow. Felicia Graham: 05:44 No, 13 since 2005 right. That’s 13 years. It will be 14 this March. Jeff Stone: 05:53 So are you still shooting photos for them now? Felicia Graham: 05:56 Not so much. I don’t shoot as much as I used to. The lighting and stuff in the new place is not my favorite, but I do like once a year these days. But I do all the outside Derby events, like people’s baby showers and going away parties and stuff like that. I shoot those things. Jeff Stone: 06:15 Oh, for the, like the roller derby players? Felicia Graham: 06:18 Well just I shoot my life and that’s the things I go to. So I, I’ve noticed that I have a ton of derby pictures. There just not of the actual games or bouts anymore. Jeff Stone: 06:29 So I’m curious with the amount of years that you, that you spent there, you know, your book really is kind of like the birth of modern roller Derby then would you agree with that? Felicia Graham: 06:40 Yeah, I think so. I mean it’s got a lot of the older leagues like in it like some of the Kansas City girls are in there and the Mad Rollin’ Dolls and it also has some of the old leagues that were really good skating against our girls, so it’s pretty cool. You know, I had them skating against London and stuff. Because London was like the first non American league to form years ago. There like the godmothers of European Roller Derby. But they were like showing all the skaters how to skate, like how to play the game. A lot of things that they do now came from our league and it’s pretty cool. But then they learned tricks around the the rules and they have to keep changing the rules to get people to stop abusing the loopholes. Do you know like they start doing the stopping in skating and the kneeling on their knee and all the weird things that they do that somebody will find a loophole. It’s just been different over the years watching the league’s progress and the rules change. Jeff Stone: 07:47 Interesting. So when you first started shooting them, you were saying that you kind of just started as a graduate student to, to kind of go with your friend and take photos and she went just once to kind of try it. Felicia Graham: 08:01 Yeah, I literally was planning on just going that one time just to do something out of school. And I was addicted and started shooting all the bouts from then on. Like I shot most of the bouts that year and then went to the Dust Devil first tournament of Roller Derby back in 2006 and that’s when I started shooting black and white. That’s where that came from. Because I wasn’t the lead photographer. So I brought my film camera and shot black and white film the whole time and the girls love the pictures and so they asked me to just keep doing it. So it saved me from worrying about white balance for the rest of the time. All I had to do was shoot. Jeff Stone: 08:39 Interesting. Yeah. Had you ever shot like high action sports like that before? Felicia Graham: 08:44 Oh God no. And I will admit that I was pretty bad at it for a couple of years. Like the action shots I shot don’t start getting good until like the end of 2006 maybe. Yeah. Cause the stuff from, from the summer bout in Seattle, those pictures turned out really good. They had really great light there. So all my action shots are like crisp and clean, but it’s hard. It’s not easy shooting roller derby at all. I mean the action stuff, it took me so long to get good at that. Jeff Stone: 09:17 What’s hard about it? Felicia Graham: 09:18 Well most of the time you’re in a location that the lighting is not very great. So you’re shooting at a low shutter speed and trying to capture people speeding around a rink. So you’d want like that’s why Seattle was so great cause they’re in this like big auditorium with like big giant light so those like I had a higher shutter speed so I could capture the action. But Playland Skate Center on the other hand does not have great lighting and we weren’t using flash. So it was, it was difficult. That was hard there. I love when they moved to the Convention Center and they got to like tell them what kind of lights they wanted. So we got to have an input on how the lights were. Jeff Stone: 10:05 So they skated out of Playland for a couple of years, I guess, right? That’s what I had heard. Felicia Graham: 10:10 A lot of years. We skated there for my first like four years or something. Until they moved to the convention center. And that where they started was at Playland. Jeff Stone: 10:20 Hmm. Interesting. I didn’t know that. I knew that they skated out of Playland, I just didn’t know that it was for that many years. Felicia Graham: 10:29 Yeah. A long time. And they used to have rock and roll bands play there. At the end of the rink. It was pretty cool. Rock and Roller Derby. Jeff Stone: 10:39 What got them to move? Felicia Graham: 10:40 Oh, well they finally got to go to a bigger place – the Convention Center. And they tried that for a few years but they couldn’t uphold it I guess. And so they went there and now they are in a smaller place – the Austin Sports Center. I don’t like that place that much. Jeff Stone: 10:58 I think I saw them at the Convention Center many years ago. Felicia Graham: 11:02 Yeah, no, that place was nice. I got a lot of great pictures from those days. Jeff Stone: 11:08 So I know you said you never skated before, but you’ve also now been around skaters for a dozen years. I have to think they must’ve tried to coerce you into (skating). Felicia Graham: 11:23 So the girls tried to get me to skate, the ones that I started skating, like shooting back in 2005. They kind of were like, “you should try, you should try it”. And I was like, “no, I don’t want to hurt myself”. And then every new group of girls are like, “why don’t you skate? Because I don’t want to hurt myself.” I know I’m going to hurt myself if I tried to skate. I’ve seen, I’ve seen people hurt themselves. It’s not a pretty thing. I try not to shoot like really bad injuries cause that’s just mean. Jeff Stone: 11:56 Yeah. I know the one time that I went and saw them at the coliseum, somebody got hurt so bad that they had to call in an ambulance. That was pretty sad. Felicia Graham: 12:05 Oh. See? See what I’m saying? I know better. I’m clumsy. I’m not going to lie to you. I’m clumsy. I’m definitely going to fall over on skates. Jeff Stone: 12:15 Maybe describe for the listeners because I mean, I’ve seen a bout, but there’s people listening from all over who may never have actually even seen a roller derby bout. I mean, there’s some pretty hard hitting out there. Felicia Graham: 12:28 There are. And there’s some girls that could barely touch you and just send you to the floor. So I mean, you gotta be, you got to have a really good center of balance to skate. Because if you don’t have that, you’re going to fall over no matter what you do. Jeff Stone: 12:43 What was the worst injury that you ever saw when you were shooting all these years? Felicia Graham: 12:49 I’ve seen torn ACLs, but you can’t see that. I just see people hurt on the ground and find out later they tore their ACL or something like that. But I’ve seen busted up noses and I haven’t seen broken bones. I haven’t seen that, but I seen people hurt themselves and find out later it’s super bad. Jeff Stone: 13:12 I imagine with all these years that you spent with the team that you must have an interesting story or two. Do you have one you might want to share with us? Felicia Graham: 13:22 Well I remember one of my favorite times is when we went to London. And I went with the Hustlers back in 2010. And it was awesome because we went like for a week. But we went for a week and just hung out and in London and then the last three days were just roller derby and we like hung out with the London Rollergirls that week. And then on Friday and Saturday I think there was a training camp for European skaters. So I helped check in girls that couldn’t speak English. It was awesome. They were like girls from all over the place, small towns in France and stuff like that, that I’ve never even heard of. And they’re all like so excited to learn from the Texas Rollergirls. It was, it was pretty awesome to see how far it had gotten. I was like, this is too cool. I was like, they all want to learn from the godmother of modern day roller derby. Like they sold out their training camp. And then the London game, that was the hardest game. I kept forgetting to take pictures. I was so stressed out because it was such a close game and I really wanted our girls to win. I just kept putting the camera down and just chewing on my fingers because I was a nervous wreck. I was like, “Oh yeah, I got to take pictures”. Kept having to remind myself to pull the camera to my face. That trip was probably the most epic Derby experience I’ve had. Jeff Stone: 14:45 You were basically helping all the people that were coming from other countries. Do they speak English or did you actually have to translate? Felicia Graham: 14:53 We had to like figure it out. Like they’d have to write down their name or something like that. But yeah, some of them didn’t speak English at all, so I don’t know how they were going to learn from the girls, but they were there anyway. But it was pretty cool. I mean it makes me want to shoot roller derby worldwide. That’s for sure. Jeff Stone: 15:11 Yeah, that, that, that would be interesting. I mean with the amount of photography that you’ve done with the Texas Rollergirls, what keeps you from doing that? Felicia Graham: 15:20 Uh, money. I have to sign up for grants. That’s like the next step. I’m going to do that, see how this book does and start working on grant writing, which is not something I’m looking forward to. I’m not a writer. I am definitely a photographer. I shoot stuff. That’s how I express myself. Yeah. Cause there’s leagues on every continent except Antartica. So I mean Egypt, Japan, I mean so many different places I would love to go and shoot and show how different it looks. You know? Or how similar things are. What translates amongst all the Rollergirls worldwide? I was going to say I did my thesis (or a report they would call it) at UT Grad school on the Rollergirls and I interviewed them all and it’s pretty cool because they’re all from all different walks of life and have all different kinds of reasons for joining Roller Derby. But they all get the same thing out of it. And that’s confidence and strength and stuff like that. It’s pretty cool. It’s like they might be all different but they all get the same thing out of it. I think that’s pretty awesome. Anything that gives women strength I think is a pretty cool thing. Jeff Stone: 16:29 So I think that in and of itself sounds like a book. You interviewed all these folks you said for for your thesis and have all kinds of data? Felicia Graham: 16:41 Yeah, like 30 of them. I asked them all the same questions and then wrote like a 65 page paper for my thesis. I’m not sure if my teachers actually read it or not. They just assumed I covered everything in 65 pages when I had to turn in 20. Jeff Stone: 16:56 Besides the confidence factor that you said all of them kind of appreciated getting from Roller Derby, were there any other tidbits or interesting things that you learned from doing all those interviews? Felicia Graham: 17:08 A lot of the girls didn’t like other girls before they joined Roller Derby. It’s like they got something out of the camaraderie that they weren’t expecting, which is pretty cool. I mean, I, I’ve been lucky enough to be kind of a pseudo roller derby girl, so I, uh, I get to benefit from getting to be part of these girls’ lives and stuff like that. And you do gain a sisterhood from it. I’m still going to stuff. Like I’m shooting one of the girls weddings in a couple of months and, and stuff like that. Like I’m still a part of their, their, their lives and it’s pretty awesome. They’re pretty awesome women. I’m glad they’re, they’re my friends. I’m glad I get to call them friends. Jeff Stone: 17:55 That’s neat. Yeah. So you’re saying that a lot of them don’t, they didn’t have a camaraderie with, with a group of girls before this, it sounds like. Felicia Graham: 18:04 Yeah, that was one thing that a lot of them had in common that I noticed from the get go. But they have a lot of friends that are women now. Jeff Stone: 18:18 Did you just shoot bouts during all these years or did you actually go and like shoot practices and other things as well? Felicia Graham: 18:26 I shot other things like them in weddings and parties and baby showers and stuff like that and some of them at work and stuff like that but that stuff didn’t make it into the book. I turned those into the design company that I hired – I hired Pentagram Design – they’re awesome. And they did a really good job on my book. But, they didn’t pick any of the non-derby stuff for the book. But yeah. Which I don’t mind. Jeff Stone: 19:01 How many shots, how many photos do you think you actually took? Felicia Graham: 19:05 Over the years? Thousands upon thousands of them. I mean, there’s some bouts that I would shoot a thousand alone, like over a thousand just for that day. Multiple that by five or six a year for you know, a bunch of years. Yeah. There are a lot of pictures. I mean like the London, I mean I don’t even know how many pictures I took just in London. I just had gone nuts there. That was really fun. They did a lot of street skating and stuff. Yeah, they liked to street skate when they’re out visiting places. Like they did it in Montreal. They did it. They did it in London, it was pretty cool. I went with them when they do that stuff. Jeff Stone: 19:56 So what kind of street skating are they doing? Just going fast down, down the street? Felicia Graham: 20:01 Yeah, just up and down cool streets and over bridges and stuff like that. I think we went on London Bridge in London and they were just up and down the street. They’d be on their skates while we walk to record stores and stuff like that in Montreal. They just like being on skates. Jeff Stone: 20:19 I could see that. It’s like a, it’s like the most comfortable pair of shoes once you’re really good at it. Felicia Graham: 20:25 Yeah, they love it. They’d rather roll than walk. Jeff Stone: 20:29 So with all these years that you’ve been covering them, you know, when you were saying in the beginning that you’re just really passionate and kind of fanatical about Roller Derby. I was curious to know from your perspective as somebody that is a photo journalist and somebody who’s obviously friends with all these folks, what is it that interests you so much about Roller Derby? Why do you like it so much? Felicia Graham: 20:53 I like the sport of it. Once I figured out what I mean it took me a year to figure out how they were scoring points but once I figured it out, it’s fun to watch. It’s pretty intense. It can get pretty rough out there and like, and it can be close games. Close games are really fun. And I don’t know, it’s just watching some of these girls do things like jumping over people and like it’s pretty impressive to watch them some of the sport of it. Some of these girls just blow my mind. Jeff Stone: 21:28 So you were saying earlier that the girls all said that, you know, kind of community and getting like a clan of women as friends was one of the things that they got out of Roller Derby. I was wondering, you know, for those girls who actually do compete, what other things do you see that they are getting out of roller derby that make them, you know, enjoy this sport and enjoy doing it? Felicia Graham: 21:51 Well, it’s the exercise. I mean, besides getting the strength and competence and the camaraderie, those are two pretty awesome things, but they do get a great way to exercise and get out your aggression. Jeff Stone: 22:03 You said you went London and you went to Canada. Did you get to go to any other international places with the girls or were those the only two? Felicia Graham: 22:11 Those were the only two international, but I’ve done Tucson several times. I’ve been to Philly, Portland, Dallas, Houston. So I’ve gotten a bunch of trips with them. I wanted to go to Australia, but I got a job on a movie so I couldn’t go. Jeff Stone: 22:31 Well, you can’t turn down a movie if you get to do photos for that. What movie did you, did you get to shoot photos for? Felicia Graham: 22:38 I think it’s called In The Line of Duty now. It was called Mission Park when I worked on it. It was in San Antonio. It was pretty awesome. It was the hottest summer I’ve spent in Texas, and I was in San Antonio in the month of August, so it was pretty brutal that way. But I sure did have some good tanned skin afterwards. Jeff Stone: 22:59 Well, I was, I was looking through your website and I did see that you do photography for all kinds of stuff like movies and documentaries and musicians. I think I even saw a photo of Danny Trejo? Felicia Graham: 23:11 Yes, you did. He was on a movie I worked on a few years ago. He’s like the nicest human being I’ve ever met. He’s been in like over 400 movies. Jeff Stone: 23:21 Machete kills, I think was one that my wife and I went and saw at the Alamo. Felicia Graham: 23:26 Yeah, no, he’s, he’s incredible. And you know the fact that he’s such a nice human, it doesn’t surprise me that everybody wants to work with him. Felicia Graham: 23:49 Well my favorite’s always been this picture of Tinker Hell. It’s one of the first pictures in the book. And she’s putting like Mascara on in the mirror and she’s got her fish nets on, her uniform on. And her fishnets are like the triangle and the floor also has got little triangles and then the chair has got little triangles or rectangles or diamonds. There all diamonds, not triangles. So all of those little diamonds in the picture. It’s like this, I don’t know, and it’s cool cause she’s putting on makeup to go play a sport. So it’s like this juxtaposition of like she’s in a uniform but yet putting on makeup and then it’s got all this cool graphic thing going on. But it’s been my favorite for a long time. I took that picture a long time ago. Jeff Stone: 24:39 Yeah, it is really neat. I mean, Roller Derby is, it’s very unique. I mean, just with like the names and then the team names. I think the actual individual skaters names and then all the, you know, the makeup and the different things like that that go into it as well. I mean, it’s really sports and entertainment at the same time. Felicia Graham: 25:00 Yeah. I mean, it’s fun. It’s fun to watch. If the girls are having fun, they get kooky and do tricks on skates and stuff like that. I’m like, “y’all are crazy”. But I have like a girl doing a handstand on skates in my book. Jeff Stone: 25:19 Yeah, I saw that one. It looked like she was at Playland too when she was doing that. Felicia Graham: 25:23 That was Playland. Yes. Definitely. A lot of the pictures in that book are from Playland because there were a lot of years there. Jeff Stone: 25:30 Yeah. I noticed the, I noticed the sign that was up on the wall and the little dome colored lights that were on top of the ceiling. I was like, “oh, that’s Playland”. Yeah. That had to be a very hard place to shoot. Felicia Graham: 25:47 It was so hard. I don’t know how I got so many good pictures from there, but I made it work and I didn’t use a flash. Jeff Stone: 25:55 Because that place is really dark. Felicia Graham: 25:57 It’s so dark. I don’t know how I did it. Because back then I was using my first digital cameras and stuff like that, that weren’t that great. So I am very surprised that I got as many pictures from that as I did but it worked. I mean it worked somehow. Sometimes as a photographer, you kinda just have to make it work. Jeff Stone: 26:24 So what were some of the toughest shots for you to get? Felicia Graham: 26:29 I mean the action stuff is definitely, that took the longest time to, to master. So I want to say anything like anytime that there’s an impact that I’m trying to capture, those are hard to get. Yeah. Cause like I got some good shots of people barreling into another person and they’re like grimaces and stuff like that. Those are, those are fun to get, but they’re hard. You don’t get a lot of them. So you’ve got to take lots of pictures and hope for the best. Jeff Stone: 27:00 So I’m curious, with 12 years, 13 years of doing this, have you ever been injured while you were taking photographs? Felicia Graham: 27:09 I have two times. One time was just bruises, but it was pretty funny. I got Buckshot Betsy came sliding into me. So instead of her hitting my camera, I did the lean over and protected with my leg. And so her skate went right into my thigh and I had four nice bruises for like a good solid week from that. But the one that I almost captured, I captured the reaction of it happening in my photos. I’m shooting the bench of the Executioners and I’m photographing them and I see their eyes get bigger and bigger and then I feel someone’s knee pad slam into the back of my head and pushed my face into my camera. And I got a nice little shiner from that. But I got the reactions on film of them watching it happen to me. Jeff Stone: 28:02 Oh man, that sounds like you were taking one for the team. Right? Felicia Graham: 28:06 Yeah. I mean if that’s the only two times I got hurt, I did pretty well. I was able to avoid collisions. The girls go flying into the crowds all the time and how they haven’t, only one time into me or twice into me is pretty good over 12 years. Jeff Stone: 28:22 Cause I mean you’re close, right? I mean you were…. Felicia Graham: 28:25 I’m right there like against the track, usually next to the bench, so I’m like at that curve. So people come around and they go straight, they’ll go straight into me if they miss turning somehow. Jeff Stone: 28:40 Yeah. And then you’re hiding behind the camera. So it’s not like you have good peripheral vision as you’re trying to shoot. Felicia Graham: 28:45 Exactly. Exactly. I can only see what’s in my camera view. Jeff Stone: 28:50 Yeah. So what was the most interesting part of of building a book? I mean, had, had you done that before and you know, what was that like? Felicia Graham: 29:01 It was pretty cool. I had, I had given up on the book idea because I had sent it off to I think Texas UT Press back in the day. And they were like, “no”. And I was like, “okay, fine, if they won’t do it though, who else, who else would do it?” So I kind of put it on the back burner. And then I went to this thing called Photofest and it’s like this big photo review and almost all the people told me that the work was strong enough for a book. So I said “screw it, I’ll do it.” And I did a Kickstarter and raised all the money for it and hired a design company. And I mean it took a while. It took about a year and a half from start to finish to get it done. But it was totally worth it. I mean, I hired the right company. They were really excited about the work. So they wanted to do a really good job and, and they, I was lucky they post when it came out, they posted an article about it, with like nice professional pictures and everything on their website. And I got Trinity University Press, uh, contacted me like right after that came out and asked me. They wanted to do the second edition of my book. So that’s what’s out right now is my second edition. Felicia Graham: 30:21 I could only get it down out of all the pictures down to 750. So I gave them 750 pictures, the design company, and made them pick. And then they came back with what they liked. And then I pulled pictures that I didn’t think should be in there and put pictures I thought should be in and that was about 20 or 15 maybe that I changed after their edit. And just kept the rest of the ones that they picked. And I was like, they should know better. They do this for a living. So I just had to make sure that certain people were in it that hadn’t gotten in there and stuff like that. I missed one girl. I’m still upset about it because I couldn’t find a picture of her that I thought was worthy for the book, cause you know you got to put the best pictures in the book. Jeff Stone: 31:07 I was curious why you chose to do black and white photos over color. Felicia Graham: 31:12 Oh, so that happened when I went to Dust Devil in 2006. I wasn’t quick enough to be the Texas official photographer, so I couldn’t shoot the bouts like an official photographer. So I just brought my film camera and shot black and white film the whole weekend instead. And the girls loved the pictures and said I should keep doing it. So I said I like it. And I just started shooting that. I didn’t have to worry about white balance anymore. So that was pretty nice. Jeff Stone: 31:45 Well, so I was just wondering, is there anything else you’d like to tell us about the book? Anything that maybe I have not asked you about? Felicia Graham: 31:52 The forward in the book is written by Melissa. She also goes by Malicious and she’s a bestselling cookbook author. But uh, she also wrote a book about the Texas Rollergirls. And so I thought she’d be the perfect person to write the forward. And the afterword is written by Dennis Darling and he was my professor at UT and kind of my mentor. So I had him, he sends out email blast with his old photos and he writes stories about them and they’re always well written. So I thought he could write an afterward for me, cause he’s very well written. A lot of photographers can write well too. So I’m a little jealous of that. Jeff Stone: 32:39 Well your photos are really beautiful, so you should, you should be happy about that. Felicia Graham: 32:43 Yeah, I just let them talk for themselves. Jeff Stone: 32:46 I think Melissa’s book is called Rollergirl: Totally True Tales from the Track. Well, and she was one of the original founders as well it sounded like. Felicia Graham: 32:55 She was there for all the drama with the split and everything. So that’s how I know all of my history is through her book. Jeff Stone: 33:06 So it sounds like you endorse it. It’s a good book, Huh? Felicia Graham: 33:09 It is a good book. If you want to know the history of Texas Rollergirls. Yeah, definitely. Jeff Stone: 33:15 So, um, what’s next for you? I mean, I, I, like I told you earlier, I’ve looked through your website and I see all the different, you know, movies and documentaries and musicians and stuff. I mean, do you have something that is coming next that you’re working on right now? Felicia Graham: 33:30 Well, right now I’m working on a reality show called the Ms. And Mrs. And usually I’m not like the biggest fan about working on reality, but this show is so funny. The people are really, really funny. So I literally laugh all day at work, so I’m kind of loving this job. But my other series that I worked on got moved to New Orleans, so besides the Ms. and Mrs. I don’t have anything lined up. It’s very slow. We need our government in Texas to bring back the tax incentives for film because for every dollar that a movie spends in Texas, it makes the state $5 and 50 cents. Jeff Stone: 34:09 Well, maybe you’ll get a chance to get some of those grants and go do a international roller derby book. Felicia Graham: 34:13 I know. I was thinking since I’m not going to be working a lot this spring, that I should start working on the grants now while I have free time. Jeff Stone: 34:23 Well, Felicia, I want to thank you again so much for coming on the show. I hope you had a good time. I sure did. Felicia Graham: 34:30 Oh good. I had a blast. It was not as scary as I thought it would be. I’m glad. I’m glad you invited me on. Jeff Stone: 34:38 Well, thanks again for coming on. Uh, if people want to get more information about you, you know, your work or your book, where’s the best place for them to go online to learn more? Felicia Graham: 34:47 Uh, FeliciaGraham.com is my website and they can get the book, Rollergirls: The Story of Flat Track Derby, on Amazon, Barnes and Noble, any place you can buy books. It’s for sale. Jeff Stone: 35:03 Awesome. Well thanks again for coming on. I appreciate it. Felicia Graham: 35:06 Thank you so much, Jeff. Jeff Stone: 35:09 All right, well I sure hope you guys had a good time listening to that. I had a great time interviewing Felicia on her book and just talking to her about Roller Derby. I mean after 12/13 years of following the Texas Rollergirls around, she really has become quite an expert on roller derby, so she’s a really great photographer and also has some really good insight on how the sport works and what it’s like to actually be a Texas Rollergirl. Jeff Stone: 35:37 If you want to get more information about the Rollergirls book that Felicia produced, please be sure to check out the show notes. The show notes are a great place to leave me a question or a comment if you had a question or a comment about the show today. It’s also a great place to get a transcription of today’s show as well as get any links. And in the case of this show, I actually have quite a few photos that Felicia took for the book up on the page. So head on over to RollerSkate Dad.com/7 and check it out. Jeff Stone: 36:12 I hope you’ve enjoyed this first seven shows of the Roller Skate Dad podcast. If you want to help me out, I’d really love it if you would rate and review the podcast on your favorite podcasting platform. Leaving me a review on Itunes, Spotify, Stitcher, or wherever you’re listening is a great way to get the podcast out to more people. Each of these podcasting platforms uses ratings and reviews to recommend the show to other people. So if you’d like to help out the Roller Skate Dad Podcast, please leave a rating and a review in your favorite podcasting platform. And thank you. Jeff Stone: 36:48 And if you’re not a member of the Roller Skate Dad Club, you’re going to want to join. Sign up is fast and easy. All it takes is a valid email address and you’re in. Head on over to RollerSkateDad.com and join the skate club today. Jeff Stone: 37:02 And finally, as I promised at the beginning of the show, I do have a special announcement to make for the month of February. Jeff Stone: 37:09 So if you’re listening to this podcast on January 31st when it comes out, then you’re going to get a headstart on everyone else. All through 2019 I’m going to be handing out a special gift every month for all the people who listen to me on the Roller Skate Dad Podcast and who have also joined the Roller Skate Dad Club. In January, I gave out a three pairs of eZeefits. These are the little ankle booties that I wear whenever I roller skate. They help to prevent blisters and they just make your skates a whole lot more comfortable when you’re skating. I want to congratulate Jamie Livesay, Nathalie Grenier and Rebecca Hansom for being the winners of the eZeefit contest in January. Congratulations ladies. Jeff Stone: 37:52 Now I wanted to tell you about February’s contest. 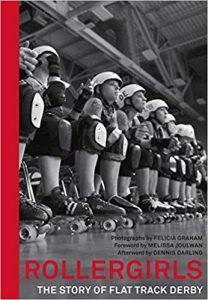 For February’s giveaway, I’m going to be giving away three copies of Felicia Graham’s book Rollergirls: The Story of Flat Track Derby. However, these three copies are very different than the ones that you can buy on Amazon in that I actually met Felicia face-to-face and actually got her to autograph all three copies. So all three copies of the book that I’ll be giving away this February will all be autographed. So something special for you guys. Jeff Stone: 38:24 If you’re already a member of the Roller Skate Dad Club, you’re going to get an email first thing Friday morning, February 1st, allowing you easily to enter the contest. If you’re not a member of the Roller Skate Dad Club, now’s a great time to join. Head on over to RollerSkateDad.com and join the skate club. And good luck on the contest. Jeff Stone: 38:46 All right, everybody, another show is in the books. I want to thank you guys so much for being here. So, until the next time, get on out there and skate. Announcer: 39:00 Thank you for listening to the Roller Skate Dad Podcast at www.rollerskatedad.com. If you liked what you heard today, please be sure to subscribe, rate, and review the podcast on Apple Podcasts, Spotify, Google, or wherever you’re listening. Thanks again for rollin’ by. If you have a question about the podcast or just want to leave me a note, please comment below. Please subscribe to the podcast on whichever podcasting platform you listen on. And, don’t forget to join the Roller Skate Dad Club. You can do that easily with just your first name and email address from any page on this website. Until the next episode, get on out there and skate!